Yom Kippur is, as is generally know, the most somber and solemn day of the Jewish calendar. Coming closely after the Jewish New Year when Jews pray for forgiveness for their sins and reflect on their intent to better themselves for the coming year, Yom Kippur is believed to be the culmination of this period of penitence, and accordingly, Jews fast and pray on this day. 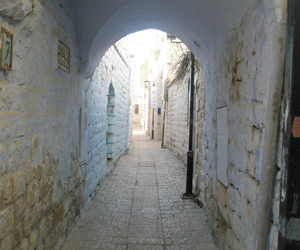 It therefore comes as something of a shock to see the morning after Yom Kippur, mere hours after the fast day ended, people rushing through the streets preparing for the next holiday. This time, everyone is in a joyous mood, trading good wishes for the next holiday, Succot. Succot is also known as the Feast of the Booths, or, in Christian tradition, the Feast of the Tabernacles. It commemorates the small flimsy structures that the Children of Israel were forced to live in while wandering through the desert on their 40-year trek from Egypt to Israel. During this week-long festival, Jews build "succas", or small temporary structures, next to their houses, and eat and sleep in them. Immediately following Yom Kippur, the people of Tzfat begin to pull out their succas, which have been stored away for the past year. Wooden walls, plastic sheets, and often a patchwork of both make up these booths, and people rush back and forth from neighbor' to neighbors', borrowing nails, twine, and hammers as they try to figure out a plan that will allow their succa to stay standing for a week. Jewish law states that the succas are to have roofs that one can see the stars through, and here, Tzfat residents begin to get creative. Aside from the branches of the trees which city workers prune during this week, City Hall can count on local citizens to helping with the municipality gardening, since the nights preceding the holiday find local residents wandering the streets with saws and trimmers, ready to snip any stray branch that they see. The trees in the woods surrounding Tzfat are also trimmed in this way, insuring that the local fire hazard will minimize a bit in the coming spring. In the meantime, succas begin to sprout throughout the town. Some people have porches or private areas next to their houses where they construct their succas, but many people in apartment buildings build their succas on the sidewalks next to their building, and some, even on the buildings' roofs. There are some neighborhoods where one cannot walk along the sidewalk for the week of Succot, but no one minds, since the holiday, even for those who don't build a succa, is universally enjoyed. Neighbors with succas invite in their friends who don't have succas, and a typical Succot night in Tzfat is one where one can walk along the street and hear dozens of songs and conversations in the structures which are lined up one next to the other, and, of course, smell endless dishes of piping hot stews, soups, and other tasty dishes. It's likely that this is exactly what the scene was like in the evenings 3300 years ago as the Children of Israel made their way from Egypt to Israel.